A very interesting Victorian internal or external door with an fascinating history. The door has an oak external face and pine internal face, a design used in the Victorian era, as oak is hard wearing. The pine internal face was usually painted to match the room interior and create a panelled effect. The oak and pine panels are well made with mortise and tenon joints and have been attached to each other. The door was used in the headquarters of Sotheby's auctioneers in Billingshurst and dates to approximately 1890. The door has six solid panels with chamfer detailing to the rails and stiles. The door has been sanded to bare wood. The wood is ready for finishing by purchaser with an oil, varnish or paint. The finish must be suitable for exterior use if to be used externally. The door is antique and therefore has some signs of wear. The wood is old and riven with lots of character. There are some holes and marks where the door hardware has been removed and some marks in the grain and colour variation. Slight knocks, especially to the door edges. 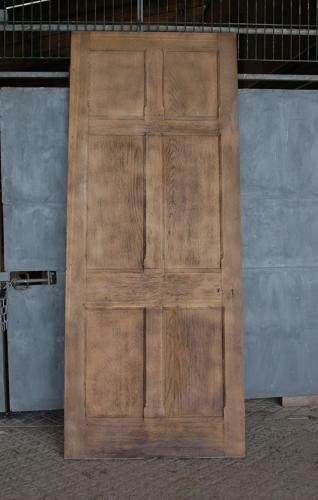 The door has an abundance of rustic character and would look fantastic within a period home. The door is solid and large and very desirable.